I’m still waiting for my copy of Interweave Crochet to get here (my mail is always so slow when it come to crochet magazines!) but you’ve probably already seen the preview, so it’s time to mention it. This marks my first published design in Interweave Crochet, The Breezy Hat (ravelry link). This is a great, simple pattern that will help you bust through your stash like whoah. You can also work it with just one color if you want to try out a new summery yarn (I used Lion Brand Cotton-Ease for the sample, but anything worsted weight will do). I just have to mention that if you pull the hat down that nub on top doesn’t show. Maybe I just have a big head, but on me, there was no nub. 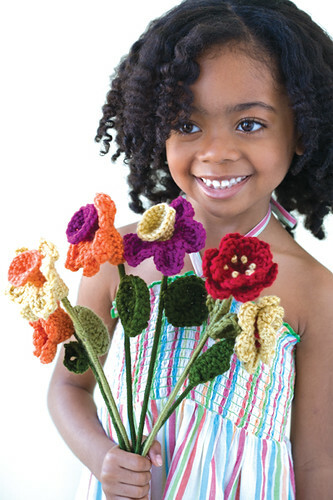 I also have a couple of cute (if I do say so myself) projects in the latest issue of Crochet Today. 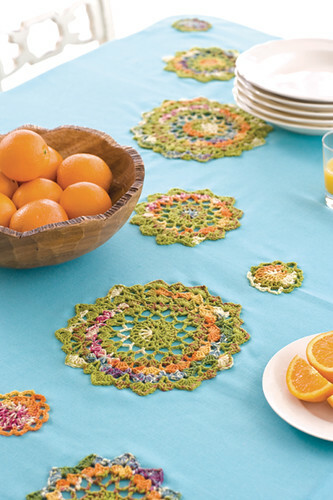 This doily tablecloth would look nice on your patio for a summer picnic. I used sock yarn to make it, which gave the doilies an instant color-changey-fiesta feeling. You can also just make the doilies to use as doilies, and not go to the trouble of sewing them down, which would probably make the tablecloth easier to clean (I was sewing for a long. time. to complete this. Hand. Sewing.). The pattern is a shell repeat that gets slightly wider as you go, and I found it really fun to work. I am really into patterns you can memorize after a few rows. My other project was this cute daffodil and rosette bouquet (ravelry link), complete with stems. These flowers will stand up in a vase and will never leave that nasty flower funky smell, which is a plus. I think they’d be extra dreamy if you used a nice cotton yarn with good stitch definition. For this design, I had fun coming up with a solution to inserting the stem in such a way that you wouldn’t see it from the flower front. If you want to know my crafty stem secrets, you’ll have to pick up the magazine. Crochet Today has a new look and a new publisher- so this issue is definitely worth checking out. And for the record, I’m in love with that Doris Chan sweater on the cover. I’d love to make it, but then it would remind me that there’s no beach nearby. Sob. I love the doilies! They were one of the reasons why I bought the current Crochet Today! Do you have a Flickr group? yay! i did the styling for that issue so i'm glad you liked the photos. ahhh, my last freelancing job for a while! i knew the doily tablecloth was yours before they even told me! Congratulations, Linda! I am not surprized though - your patterns are fabulous! I must make that hat and the flowers are adorable. What fun projects! I especially love that doily table cloth. Congrats too on your publications!